Restores, protects, and enhances exterior trim of any color! Most of the vehicles on the road today share one thing in common: exterior trim that looks great at the dealership, but slowly fades to an unsightly gray. BLACKFIRE Tire & Trim Sealant makes dull trim a thing of the past with its thick, penetrating formula. That�s right, this unique formulation will actually penetrate the pores in your vehicle�s plastic, rubber, and vinyl exterior trim making it look as good as new! BLACKFIRE Tire & Trim Sealant is designed with the user in mind. It�s more than a trim dressing, it also restores and protects at a molecular level. When applied to your vehicle�s trim pieces and tires, BLACKFIRE Tire & Trim Sealant creates a strong molecular bond that not only restores the look of the surface, but also provides months of durable protection. Just like your favorite wax, BLACKFIRE Tire & Trim Sealant seals out water causing it to bead up and roll away. This faded bumper is immediately brought back to life with just one layer of BLACKFIRE Tire & Trim Sealant! While some trim restorers leave behind a sticky, greasy mess, BLACKFIRE Tire & Trim Sealant brings back the factory look of surfaces. Since it dries to the touch, BLACKFIRE Tire & Trim Sealant can be used on moldings, bumpers, air vents, wiper cowls, louvers, wiper arms, side mirror housings, mud guards, bed rails, door handles, and more. The formula�s UV inhibitors will prevent sun damage, keeping the surface looking new for longer. BLACKFIRE Tire & Trim Sealant does not contain any dyes or colorants, just a polymer-based blend of unmatched protection for your trim. The surfaces will look and feel like the day you drove off the dealership�s lot and you won�t have to worry about streaking or dripping when the car gets wet. Since the formula is thick and gel-like, BLACKFIRE Tire & Trim Sealant is very easy to apply�it spreads evenly and dries completely! 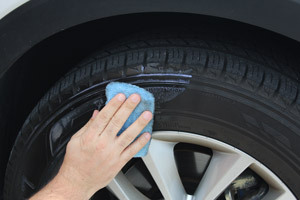 BLACKFIRE Tire & Trim Sealant is as easy as wiping-on, and wiping-off! The trim on this Kia Soul doesn't look so faded or dull, but when you use the BLACKFIRE Tire & Trim Sealant you can see how much improvement is made! BLACKFIRE Tire & Trim Sealant restores, protects, and enhances exterior trim of any color. This polymer-based trim restorer doesn�t contain any dyes or colorants. The formula creates a finish that looks and feels like the day your vehicle was new. 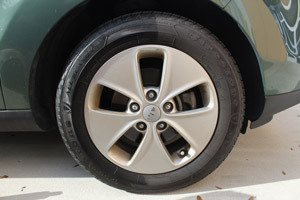 BLACKFIRE Tire & Trim Sealant will not streak or wash off when it gets wet. The only maintenance required is regular washing with a quality shampoo, like BLACKFIRE Wet Diamond Conditioning Shampoo. Restore, protect, and enhance your trim and tires with BLACKFIRE Tire & Trim Sealant!